Instant Imprints Surrey, BC | Custom T-Shirts, Embroidery, Signs and More! At Instant Imprints Surrey, our customers come to us when they want to be more visible to their customers. We create that visibility five different ways: Branded Apparel (embroidery), Signs & Banners, Promotional Products, Custom T-Shirts and Print Services. These guys did a really great job printing our shirts, we needed them done the same day and they were the only ones that could do it. We even got a banner made from them same day. thanks for saving the day guys. BC’s best print shop is right around the corner, here in Surrey. Whether you’re looking to print a gigantic poster or a series of brochures, our professional print shop can deliver you a final product that is sure to turn heads. At Instant Imprints, you get the quality of a global industry leader with the attention-to-deal that only a local shop can provide. Our Image Experts in Surrey are happy to answer any questions you have, and see your project through to its completion. Custom t-shirts are your brand’s ticket to the hearts, minds and sleeves of people. The power of customized tees is well known across the world as a way to give your logo legs. Here in Surrey, we provide you with a custom t-shirt service that is rivaled to none, where you can get everything from jerseys to work shirts and everything in between. In addition, our custom embroidery service takes your brand to a whole new level of sophistication. One of the most dependable, tried-and-true forms of promotion out there is the classic sign. Whether you’re looking to decorate your storefront or the motorway, a sidewalk sign or a billboard banner can bring your brand to anyone who passes by. 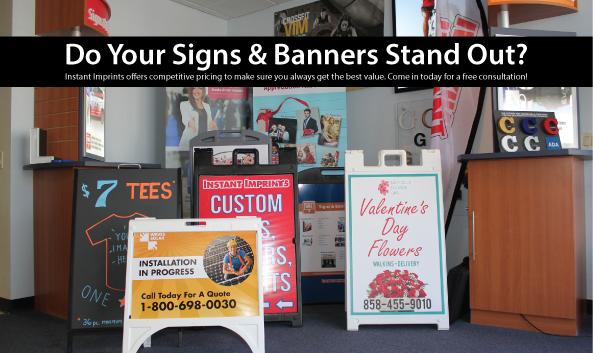 Our wide range of customization options, including different materials, sizes and inks, mean that you can make a sign that is unique to you and your business. No matter what your promotional goals are, Instant Imprints in Surrey is here to help. Stop by our showroom on King George Blvd., give us a call at (778) 565-7480 or request a quote online to get started today!